This unit has bare legs and sun bleached hats. The coat colours are genuine from the Spanish Army of the period although I am uncertain if detachments from this particular unit served in Central America. 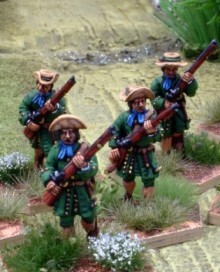 Warfare Miniatures from WLOA4. Each pack has 5 miniatures. All are in different poses. These are NOT head variants but unique sculpts which compliment each other. This means the first release has 45 different models. Pack price will be announced shortly. The models are packed in 5s so that units can be formed for use with Beneath the Lily Banners. 25 models(5 packs) will provide 15 musketeers, 5 pikemen and 5 super numaries making up a wide variety of combinations of battalions Firing, At ease, Advancing and Marching in the 4 'stand' structure used by the rules. Pikes and officer weapons will be sold seperately. Future releases are well advanced in terms of planning and the range will form a fully complete spectrum of Foot, Horse, light and heavy artillery, casualties, supernumaries and personalities for the period. I will be running a Beneath the Lily Banners 2 game at Claymore this year and my Walcourt game will appear again at Derby (I hope if I can secure a table!). The game may also appear at CRISIS in Antwerp in November.